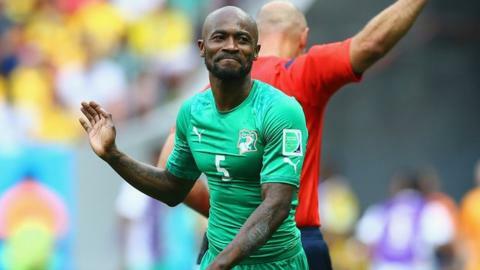 Didier Zokora has turned down the chance to come out of retirement and play for Ivory Coast in their final two Africa Cup of Nations qualifiers. Coach Herve Renard had recalled the 33-year-old for the games against Sierra Leone and Cameroon. "It is with grief in my heart that I write to say that my decision to retire in September stands and I will not change my opinion," Zokora said. "I took the tough decision to retire after consulting with the federation." The 33-year-old, who now plays his club football in Turkey, is Ivory Coast's most capped player with 121 appearances for the Elephants. "I wore the shirt of my country with pride but this page of my career is definitely closed," his statement continued. "I am aware of the impact my decision could have on some of you [fans], but at this stage of my career, it is time to allow young talents to emerge and take their turn to contribute to the national team." Zokora also played at five straight Nations Cup tournaments between 2006 and 2013 but insists the last edition will be his final one. He added: "Right now I only want to concentrate on my club career but I will always be with the Elephants as a fan only and not on the field. "I would like to say thank you to all those who supported me and believed in me. Thank you again for your messages and words of encouragement." He has also played at the last three World Cups, including this year's tournament in Brazil, where the Ivory Coast crashed out in the group stages. Zokora has enjoyed spells at the likes of Saint-Etienne, Tottenham, Sevilla and Trabzonspor throughout a distinguished career. Renard was hoping Zokoroa's experience would prove useful as the Ivorians look to qualify for Nations Cup finals. They are third in Group D ahead of the ties against Sierra Leone on 14 November and Cameroon five days later. Both matches will be played in Abidjan as Sierra Leone are unable to host their tie due to the ongoing Ebola crisis in their country. Cameroon top the group with 10 points, four ahead of both Ivory Coast and DR Congo - with only the top two sides guaranteed to qualify for the 2015 Nations Cup finals.